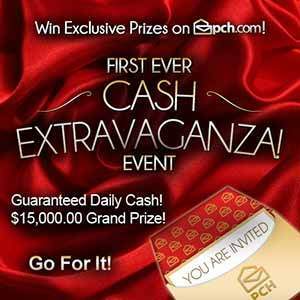 PCH.com – Cash Extravaganza Event. New promotion cash sweepstakes from PCH/Extravaganza. – This is almost instant cash in your pocket if you win. This is the first event of this kind ever from PCH Sweepstakes. Guaranteed daily cash prize of a $1,000 and a $15,000.00 Grand Prize at the end of next the week. How about winning some extra money this month? Who wouldn’t? What would you do with an extra $1,000 if you win tomorrow? For me, probably some shopping and a nice diner at a top restaurant in New York city. Now, imagine what you could do if win the grand prize of $15,000.00 Dollar from PCH/Extravaganza! Maybe some home improvement project you want to fulfill, a nice luxury vacation, a cruise on the Mediterranean sea or in the Caribbean or maybe you will want to play save and put it in the bank for a future project or retirement planning. Danielle Lam you know the Prize Patrol girl who travels the states to surprise lucky winners of PCH sweepstakes, well she will be announcing on February 8, 2014 all the winners of the daily $1000 cash prize and also she will reveal who won the $15,000.00 cash grand prize. It is possible to access the list of the daily winner at www.pch.com. Please enter me to Win A $15,000.00 VIP Exclusive Prize from Gwy No. 8924! Yes I would like the $15,000.00 Cash Prize. Thank You PCH! Search #3) Activate/Search @ PCHFrontPage to Score 3,000 TOKENS.Thanks. Yes Douglas Rogers I would love to bank 3 million born October 21st. i WANT TO WIN $15,000.00 FROM PCH Gwy. No. 7233 VIP Exclusive Prize. Pch VIP 5X Entries To Win $15,000.00 Cash Prize -7233 Activate ! I got bad news today the love of my life will not make it.So if I could win the $15,000.00 it will help me with any extra cost I will hAVE. Pch VIP Ertra Awards $10,000.00 A Week For A Month On August 31st Activate ! I want to win pch super prize, Gwy .No 6900 and Gwy No.4749… PCH is welcome to my house thank you! Please enter me to Win $10,000.00 Online Exclusive Prize from Gwy No. 7029! Please enter claim to Win A $10,000.00 Online Exclusive Prize from Gwy No. 7029! I am entering to win $10,000.00 Prize. I hope that my name is picked. Thank You! I have a question. I recently had to come to Florida on family business. My actual address is a Michigan one. So I’m hoping and praying to win #6900 sweepstake. Now my question was can you come here to Florida if I am named the winner? I want to Win PCH 5X entries EXTRAVAGANZA to Win $15,000.00 CASH PRIZE GWY NO 6085 THANKS PCH. Plus, I want to win the $2 Million Plus More which is $2 Million Up Front + $10,000.00 A Month For Life; Plus A Brand New Lincoln MKZ Car. See your smiling faces on June 30th! I hope that the PCH Gwy # 6085 is directly for me to win the $15,000.00 Cash Prize. I was just having fun. Like if I won anythiing it was in 1963 and it was $100.00. #2)”WIN IT ALL” PCH-FRONTPAGE for “LUXURY VACATION” Prize, PCH-GVWY. No. 6085 valued at $15,000.00 CASH! to visit or Paris or Peru or Cancun….Thanks PCH. I came up with $15,000.00 (PCH Gwy. No. 6085) I have no idea as to this prize so I am taking a chance to see if it’s correct or not. I sure hope it is. Thank you PCH. Please enter me for cash extravaganza 15,000 grand prize and 1,000 daily prize. PCH Win It All-Dream Life Prize of $2,Million Cashe,$10,000.00 a month for life and a Brand New Car,on June 30th, No 6900 , Please. TRYING HARD AND WISHING HARD. Pch Search 3X Entries VIP Private Envent Win $15,000.00 Cash Prize No-7233 On June 30th Activate ! MAKE IT 134 I AM BACK. EXCLUSIVE ACCESS PASS $15,000.00 VIP EXCLUSIVE PRIZE. PLEASE ENTER ME IN THE VIP PUBLISHERS CLEARING HOUSE CONTEST. I would to win the 20,000.Giveawy. I WOULD LIKE TO WIN PCH GWY NO 6058, 3X ENTRIES, $50,000.00 CASH PRIZE !!! I would like to thank each and every one of you for this opportunity. Thank you again, Elaine A.
Pch Frontpage VIP Exclusive Win $7,000.00 A Week For Life Prize No-6900 Plus, Win $15,000.00 Prize No-7233 On April 29th Activate ! Pch Prize Event 3X Entries Exclusive Win $10,000.00 Cash Prize No-7233 Activate ! OK PCH AM READY TO RECEIVE MY V.I.P 5 ENTRIES TO WINNING 15,000 GWY #7233 AM IN IT TI WIN IT ALL YES!!! Pch Frontpage VIP Awards Win $15,000.00 Cash Prize No-7233 On April 29th Activate ! PCH SweepStakes Entry! M.V.P Are Here To Stay. PCH WIN A $25,000.00 M.V.P Royal Flush Luck! GWY.NO. 4840! D.M. I want to claim my 5X entries to VIP exclisives PCH gwy no. 7233 by $15,000.00 cash prize , VIP members loyarty summary and I want to win PCH Gwy 4900 by $5,000.00 a week forever on February 26,2016. Thanks you PCH. Pch, As a VIP I would like to make 5 entries for $15,000.00 Cash. Claim 10 entries for $15,000.00, cash prize GWY 6085 & 3X entries for Lincoln MKZ, $50,00 Target and $5,000.00 a week Forever &I claim the Prize of $5,000.00 or$6,000.00 a week forever GWY 4900 26th FEB,2016 & $250,000.00 a year for life GWY 6900 & $3,000,000.00 For the Dream Home , GWY 6900 & $1,000,000.00 GWY 3577 &$100,000.00 a week for a year GWY 3080 $1,000,000.00 a year for life, GWY 3577 & $10,000,000.00 GWY 4900 The Golden Ticket & $10,000,000.00 GWY 4900 $225,000.00 for 29 years and $347,000.00 0n the 30th year. HOPING AND WISHING IT WII COME TRUE. yes pch I would love to play cash extravaganza to win cash and prizes and 15,ooo.00 . yes pch I would love to play cash extravaganza to win cash and prizes and 15,ooo.00 also 10,000.00 superprize gwy 4900,1 million superprizeI . yes pch I would love to play cash extravaganza to win cash and prizes and 15,ooo.00 also 10,000.00 superprize gwy 4900,1 million superprize and50,000 bonus gwy 4950 4902,I want to win it all all 7,000 aweek for life and forever 4900 brand new Ford explorer xlt and brand new Lincoln mks,10,0.00 aweek for life I 3 million for dream house…I would go on a awesome vacation first. .then help kids family and friends. and never have to worry about anything again. .. I now request, ACTIVATON of PCH gwy.no.4749 to win the Silver Ace of Spades, $25,000.00, CASH PRIZE. I appreciate the moments I had the opportunity to play all PCH Games to win the gwy.no.4900, $10,000.00 “A Week For Life”, on December 30th PCH LIFETIME Prize Event. I cannot closed without expressing my thanks for the PCH Staff working to allow me and others the chance to become the “WINNER”. “Continuing Prayers for the PCH Prize Patrol Elites travels to deliver the prize to the WINNER and return home with the protection of God Almighty”. I want to win $15,000.00 in cash. PCH want to Win $15,000.00 Cash 4651! Yes, I would love to win 15,000.00 from PCH plus PCH GWY. NO. 4900 2,000,000.00 at once, 10,000.00 a month for life and a Lincoln MKZ valued at 37,000. It would be a blessing and the answer to my prayer to be the winner of this sweepstake. It would be a great help to me, being totally disable and can not get any help. This would relieve the worries of how I will make through each and every month. I will me able to buy my medications without a problem, pay off my bills, pay off my son student loans, help other family member and allow me to make much need repairs to my walls in my home. These are just a few of the many things winning the sweepstake will do for me. I would also be able to donate more to the cancer foundations, St. Jude and others. Yes I want to win it all. Thank you PCH. I would love to win this opportunity to win a blessing like this opportunity for me an my family this opportunity to win it all WOULD be a blessing to me. I am here today to reply to a email about wanting to enter for the cash prize of $15,000.00 !!!! I am in it to win it so lets start winning !!! This would be a great win for some one like me. Please except this as my entry and activation of my winning number.. I thank you for your time and have a blessed day. pch I want to win 15,000.00 cash prize . I WOULD LOVE TO WIN THE 2 MILLION, TEN THOUSAND A MONTH FOR LIFE, AND THE Lincoln. OMG I AM TRYING SO HARD MY HEAD IS SPINNING!!! pLEASE, DANIELLE lAM COME TO MY HOUSE WITH PRIZE pATROL!!!!!!!!! I WOULD LOVE TO WIN THE 2 MILLION, PLUS TEN THOUSAND, AND THE LINCOLN. PCH I except you invitation to the extravagant event I would love to win the prize number 46512X25,000.00 and PCH i want to win the 2,000,000.00 10,000.00 a month for life the 3 ,000,000.00 for my dream home 10,000,000.00 and 4 months of millions, a brand new Lincoln MKZ PCH I want to win it all. PCH – From PCH GWY.NO. 3727! PCH WIN $15,000.00 Cash For A Luxury Getaway! PCH SweepStakes Entry! D.M. I want to win it All,and $10,000,000.00 Cash Prize,$5,000.00 Instant Cash Prize Today,$3 Million for Dream Home, “Forever” Prize and Lincoln MKZ!! Thank you for this chance! Publishers Clearing House I Am Ready For My Big Shooting Star To Shine Bright Amen. If Your Dreams Don’t Scare You It’s Not BIG Enough…Each Day My Dreams Scare Me Publishers Clearing House…I’m Ready To Live Out My Dreams Amen . HI PCH, I would love too win giveaway no 3577. On January 20th 2015 plus a chance to win $1,000 prize and i would love to Win $15,000.00 Grand Prize at the end of the next week. Plus too win a home improvement and luxury vacation cruise. Plus a chance to win gwy no (3600).From Pch Extravaganza. Happy Holidays Mrs Angela Williams. GOD BLESS & GOOD LUCK TO ALL entering PCH GWYS: 1830,3727,3600,3677,4616,3814,3148,4900,4557,3726,3577,3848,3526 and 3527..ACTIVATE NOW,each and everyone. Hope to see you soon Danielle, Dave & Todd. “3080”. PCH IS THIS TRUE 100,000.00 A WK FOR AN ENTIRE YEAR,THIS IS UNBELIEVABLE I LOVE PCH FOR GIVING ONE AN EQUAL CHANCES TO WIN SOME OF THESE GREAT PRIZES. WOW. PCH WIN $15,000.00 Cash For A Luxury Getaway! PCH SweepStakes Entry! From PCH GWY NO.3727! D.M. I’m So Eternally Grateful For Winning $10 Dollars My Little Will Become Much. PCHSearch&WIN! PCH SweepStakes Entry! PCH WIN $15,000.00 For A Luxury Getaway! PCH GWY #3727! D.M. $15,000.00 would be a great help for me . to sub with my s.s. retirement . would help for a long time . Pch, I will like to win the “$15,000.00 CASH PRIZE”! I want to win publishers clearing house I am in it to win it! Yes i would luv Winning $1,000.00-$15,000.00 in PCH Cash Extravaganza, this would good and right on time for the Xmas Hoildays…. I am 86 years old. I would clear what debts I have so that my son – the last survivor of my family – would not have to take any of his income to do so. He has enough problems raising my triplet 16 year old grand daughters on his income. Then I could relax and enjoy what years I have left. PCHSearch&WIN! PCH SweepStakes Entry! PCH WIN $15,000.00 For A Luxury Getaway! From PCh GWY.NO.3727! D.M. I have so much fun playing PCH. I can write about why my family and I would be so appreciative of winning, anything, from PCH…but so many people can and as they say, “there is always someone who has it worse than you.” I have a story, have been told I could write a book, but again we all do. I would like to win so my husband and I could build not one but as many as needed sanctuaries for animals. They can’t speak but they need people to care for them and I would like to have the ability to do just that…speak for them and care for them. Thank you PCH for the opportunity so this “dream of a lifetime” can happen. Blueprints are ready for the most amazing sanctuaries in the USA!! PCH i wanna Win ur Cash Extravaganza, Winning $15,000.00 Jackpot or $1,000.00 daily…..
Make me happy to know my daughter would be taken care of for the rest of her life and I know she would also share with others. well, it sure would help me pay down my MC debt, as I live on a fixed income from retirement and have to use it to make ends meet at the end of the month. Yes, it would be nice to have an extra $1,000.00 to help out. I would like to win to ensure my husband a good assisted living home . His needs have gotten worse and I need help. He is in the last part of alzhiemers. Yes I would love to win. 7000 a week for life. I wouldn’t know what to do.i can’t see me win I guts because I never win anything. Before in my life. Ok. Pch keep me in your heart. yes yes i would like to win pch superprize 3080. I would be blessed if I won.